The Stereoisomer Generator Plugin is able to enumerate all possible stereoisomers of a given compound. The plugin can handle both tetrahedral- and double-bond-type stereo centers. An example for stereoisomer generation output in MarvinView (see Fig. 1) and in MarvinSpace (see Fig. 2) can be found below. 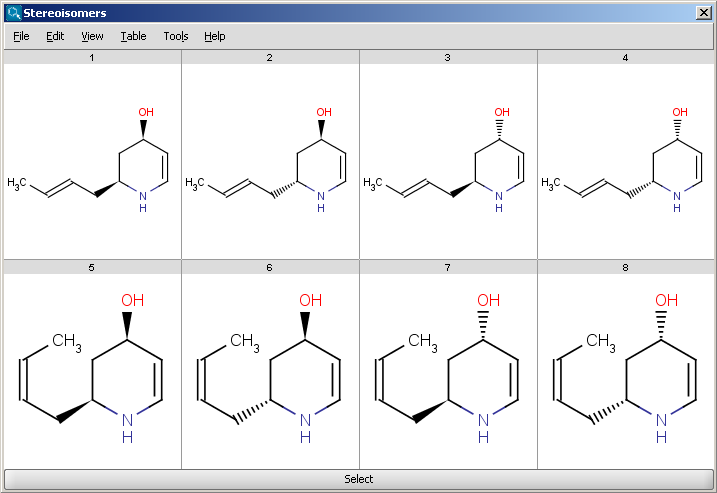 To replace your original input molecule in the sketcher with any of the isomers generated first click on the isomer. Then press "Select" at the bottom of the result window (The result window will be closed after pressing "Select"). 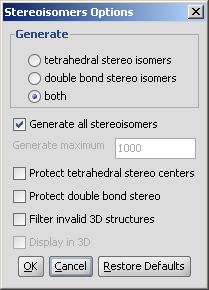 If "Filter invalid 3D structures" option is switched on in the Stereoisomers Options panel, stereoisomers can also be displayed in 3D. Tetrahedral stereo isomers: only the R/S isomers are generated. double bond stereo isomers: only E/Z isomers are generated. both: both R/S and E/Z isomers are generated. Generate maximum: sets an upper limit for the number of generated isomers. This option gets enabled if not all isomers are generated. Protect tetrahedral stereo centers: if checked, stereocenters already pre-set are not included in the stereoisomer generation. Protect double bond stereo: if checked, all double bonds with pre-set stereo information remain intact. Filter invalid 3D structures: sterically restricted isomers are discarded. Display in 3D: results are displayed in a 3D viewer. 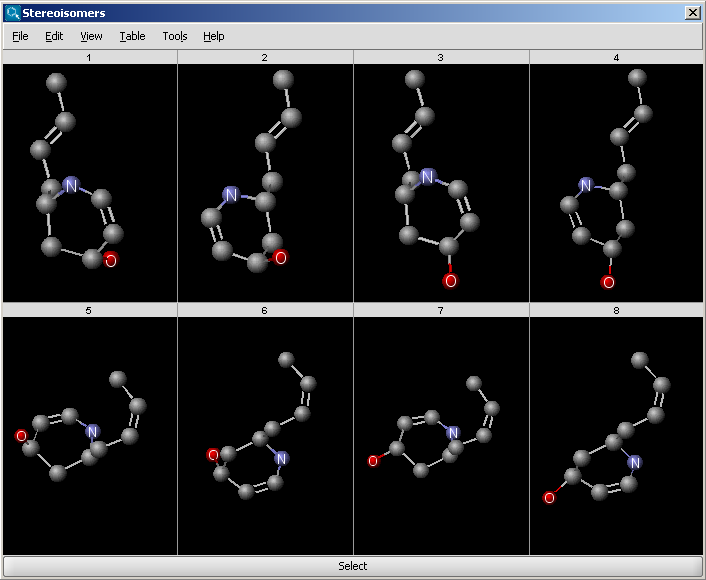 By default the results are shown in a 2D panel, one for each generated isomer. This option is enabled only if 3D filtering is enabled. You can try our Stereoisomer Generator for free on this demo page.